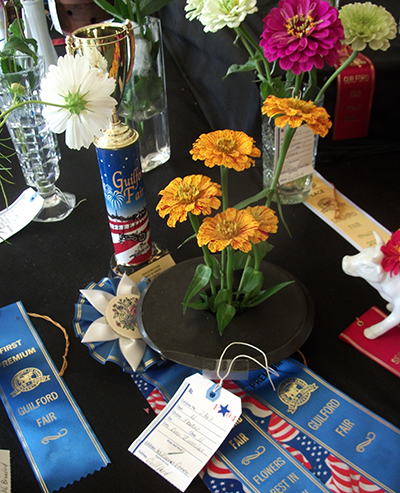 All flowers & foliage must be grown by the exhibitor unless otherwise stated. An exhibitor may enter only one entry per class. Entries close at 5:00 P.M., Saturday, September 15. 2018. Exhibits will be accepted ONLY between 4:00 P.M. and 8:00 P.M., Thursday, September 20. All exhibits must remain in place until closing Sunday, September 23. The tent will close at 6:00 P.M. and exhibits will be available after 7:00 P.M. Please be mindful of our limited display space when designing large arrangements, use non-tippy containers and always design your exhibits to stay fresh through Sunday. Arrangements with multiple components must be on a tray. We often have to move them.